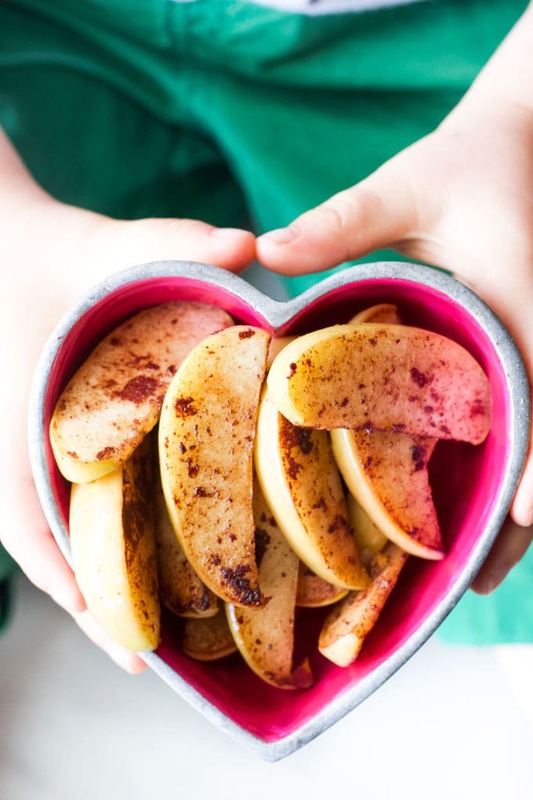 Sautéed Apple and Cinnamon Wedges are a delicious snack for the kids/babies and are so quick and simple to make. They are also perfect as a healthy dessert, served with some greek yogurt for dipping. I first published this post in April 2015. 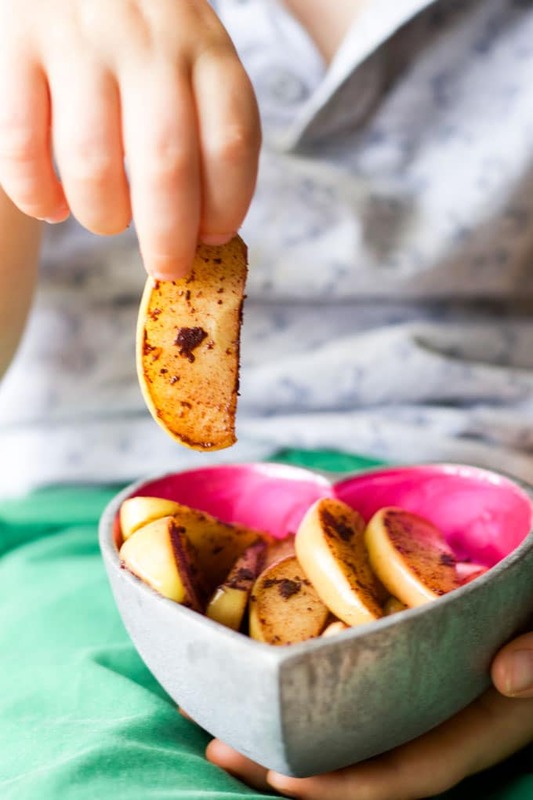 My youngest was around 6 months and I made him these sautéed apple wedges quite often. They are perfect for baby-led weaning as they are soft enough for babies to gum but solid enough for them to be able to pick up. Fast forward a few years and I am now making these for my eldest son, (six), who has his first wobbly tooth. He usually takes an apple to school with him each day but when I went into the fridge earlier this week I noticed that we had a lot of apples left. He explained he was finding them too hard to eat so was taking bananas instead! These sauteed apples literally take minutes to make, this is what I like about them most. We all know, as parents, that life is busy and we want easy, simple snacks to serve. This certainly fits the bill and within 10 minutes you can have a healthy and delicious snack or dessert. I like to cut the apples into 16 pieces. I do this by coring and halving the apples and then halving each half three more times. (see above photo). Then it is just a case of pan frying the apples in a little coconut oil (you can use butter if you prefer) and a good shake of cinnamon. Heat the apples over a low heat until you achieve your desired softness. What Type of Apples Should I Use? The great thing about apples is that there is such a wide variety of options that all have different levels of sweetness and can be used in different ways. Pies, sauces and ciders etc all have particular varieties or combinations that produce the best result. In this recipe, I do feel that it is down to personal choice. 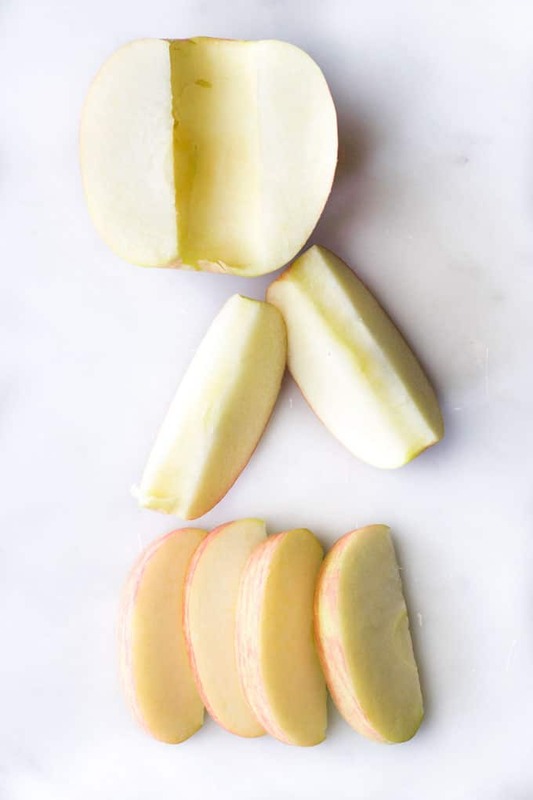 You are not cooking the apples for a long time and you don’t need them to break down to perform in a certain way. I love a sweet apple for this recipe, I haven’t added any added sugar or sweetener and like to rely on the apple for the sweetness. My personal favourite is Pink Lady but you can use any variety you please. Have you tried this recipe? I’d love to know your thoughts and see your pictures. Please leave a comment below or tag me on Instagram or Facebook. 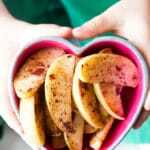 Delicious wedges of apple pan-fried in a little oil and a good shake of cinnamon. Perfect as a snack for kids/babies but also great as a healthy dessert for the whole family. Heat coconut oil in frying pan over a medium / low heat. 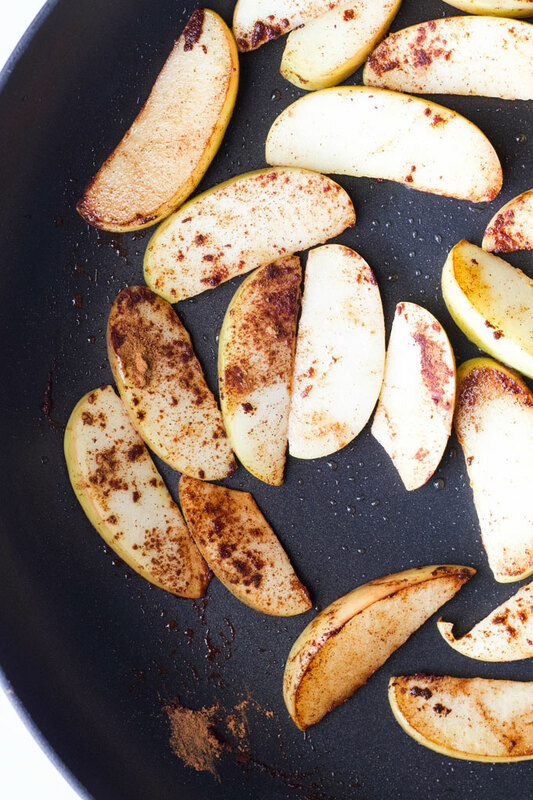 Add apples and sprinkle with cinnamon. You can use any apples you wish. As there is no added sweetener I find using a sweet apple works best. My personal favourite is Pink Lady apples. I use coconut oil in this recipe. If you would prefer not to use coconut oil then you can substitute it with butter. I use quite a bit of cinnamon as we love the taste. I don't usually measure and just put a good shake of cinnamon into the pan. Obviously, you can adjust the amount you use to suit taste. You can also omit it if you prefer. Simple and delicious. Toddler approved I believe? Glad you like it and thanks for commenting! Delicious and easy. And kid friendly too! We just planted a peach and pear tree in the yard over the weekend and I bet this recipe would be good with them too. How long would these stay good for? Hi Diana, I’m not sure, sorry. They never last long enough in our house. They do taste best just cooked and warm. Hey Amy, your recipe is very interesting and healthy as well. I liked your idea of using apple in this way and now I got a new idea of giving an apple to eat to my daughter as she doesn’t like it. Keep sharing such healthy recipes. Thank you! Hope she enjoys it this way! Do you peel the apples? (Doesn’t look like it in the pictures). If not, did your 6 mo do okay with the peels? Delicious and perfect without the cinnamon for the baby (she has reflux)! Thank you!